I’ve explained many amplifier circuits at Bright Hub, with some being moderately powerful and others massively powerful. For new electronic enthusiasts, though, making tiny versions of bigger circuits mostly becomes more intriguing and amusing. 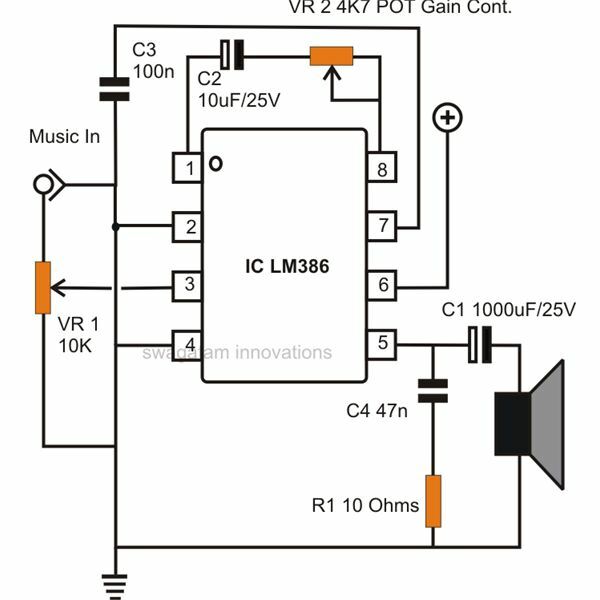 Amplifier circuits with smaller outputs may look insignificant, but are in fact more popular and find wider applications in many electronic gadgets like radios, iPods, telephones, transmitters, etc. 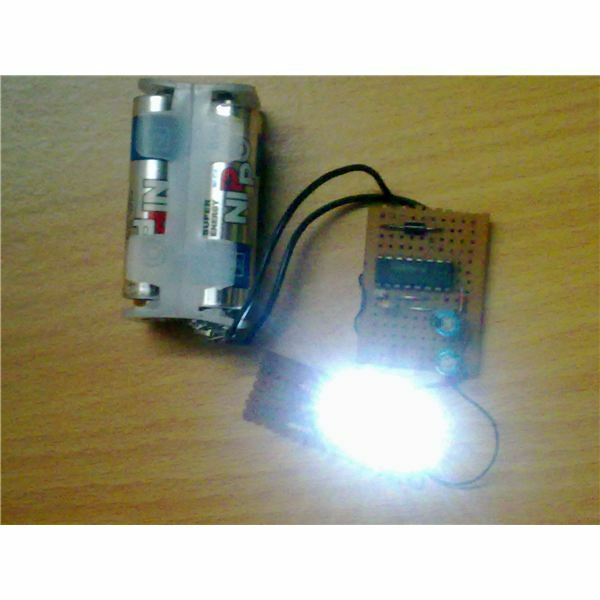 Moreover these configurations are simpler to understand, constructing them at home becomes easier, and the circuit therefore can be even attempted and completed by school students. The inputs of the IC operate with respect to the ground, while the output is automatically biased to half the supply voltage. 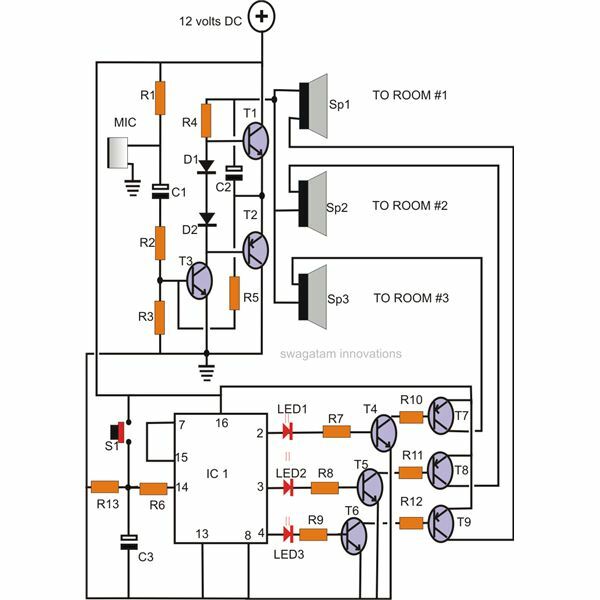 The IC is available with four versions, viz: LM386 N-1, N-2, N-3 which typically show very low distortion characteristics and function well with voltages ranging from 4 to 12 volts DC. The fourth type, the LM386 N-4, is specified with working voltages from 5 to 18 VDC, these being the final safe thresholds beyond which either the devices stop working or become too hot and get damaged. The quiescent current drain (current consumption when the IC is in the idle mode) is around 4 mA only. Maximum power output available from this IC will be around 1.25 watts over 8 Ohms loudspeakers. The voltage gain of the IC is from 20 to 200 at 26dB to 46dB respectively. The bandwidth is also quite good at 300kHz when operated with a 6 volt supply. 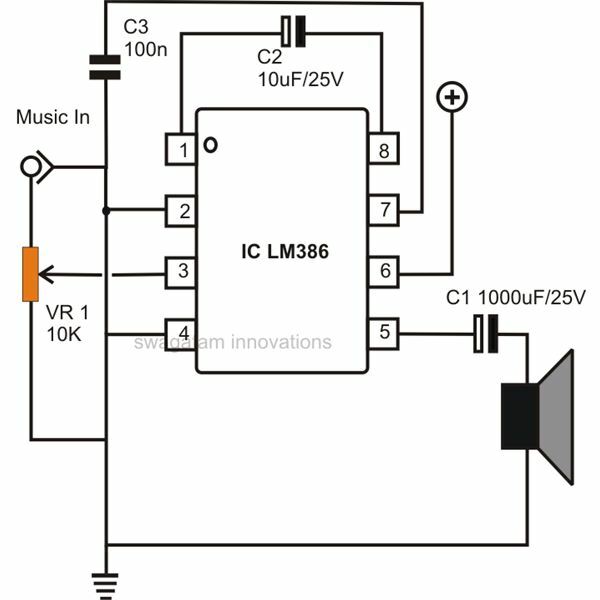 In the following section, let’s see how the above IC can be used for making different small audio amplifier circuits. The circuit below shows the basic format of wiring up the IC as an amplifier. Here, as discussed in the previous section, the gain of the circuit is restricted to 20 by keeping the pins 1 and 8 open. The internal connection of a 1.35K resistor across these pin-outs shunts the IC to the above gain. 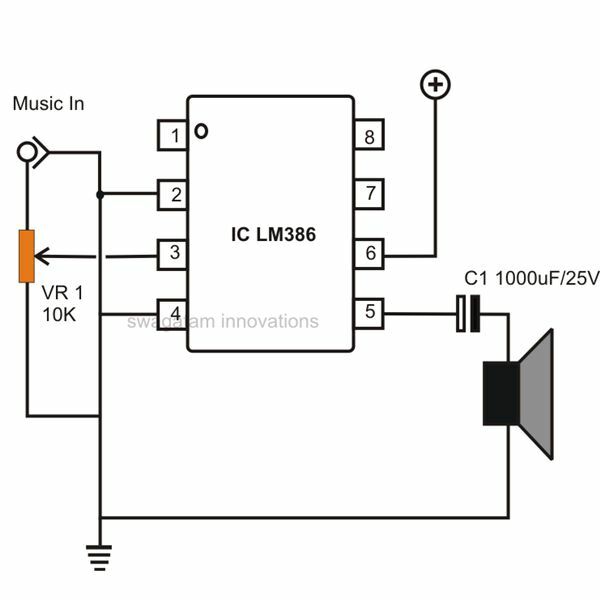 The output is connected to a loudspeaker via a filter capacitor, which is normally witnessed in all linear IC amplifier circuits. 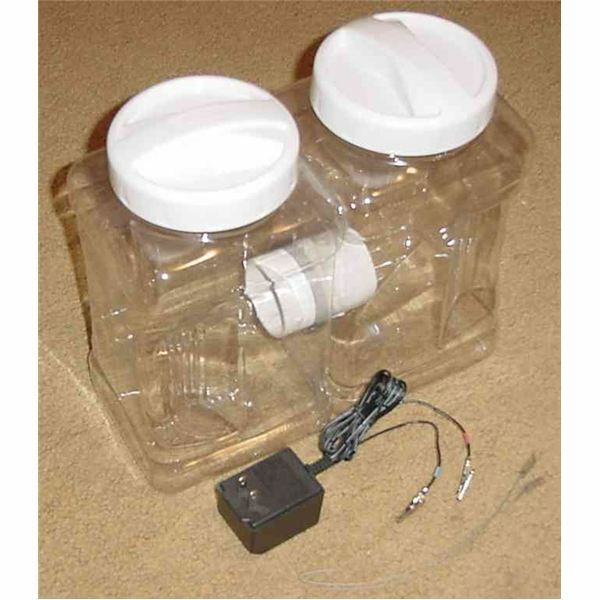 The pot VR1 at the input functions as the volume control for enabling the output to be adjusted to the desired levels. 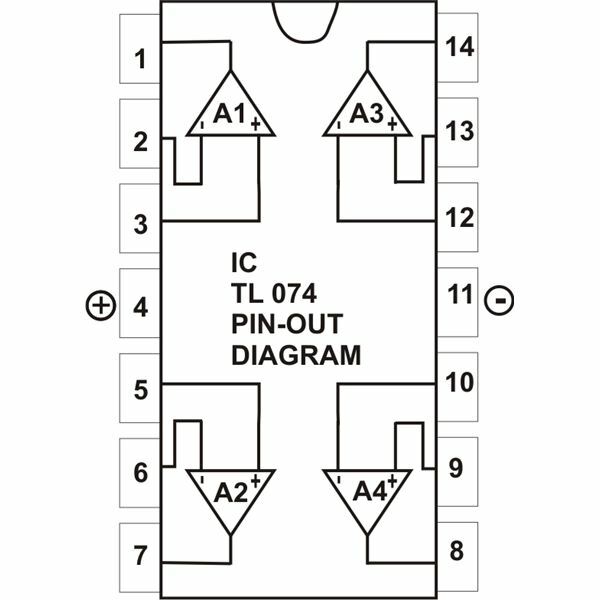 The second circuit shows how the gain of the above fundamental design may be boosted to almost 200 by adding a capacitor across pin 1 and 8 of the IC. The value of the capacitor should not be increased above 10 µF though. The gain can be made adjustable from 20 to 200 by including a variable resistor of 4K7 in series with the above capacitor. Excess offset conditions may be reduced by engaging the unused input to a resistor from the ground. However all offset issues are cancelled-OFF if the active input is coupled through a capacitor. 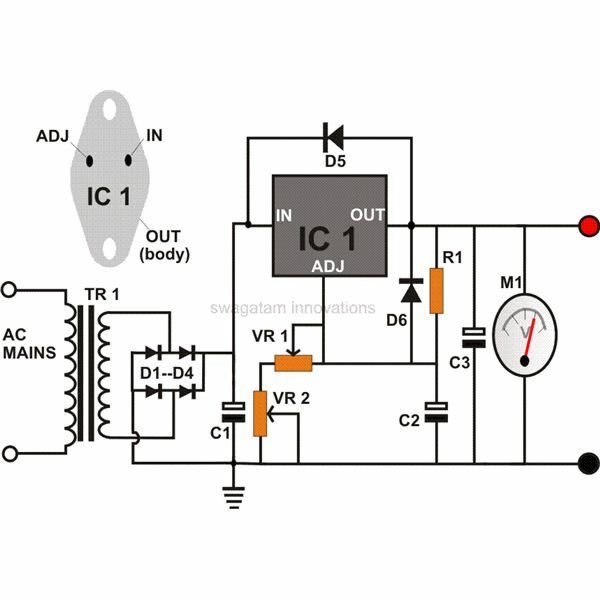 With the circuit set at a gain of 200, it becomes essential to bypass the unused pin #7 via a 0.1µ capacitor to ground for keeping the circuit stable and avoiding unnecessary oscillations or clipping. A simple but interesting bass boost arrangement can be inserted by introducing a resistor/capacitor network across pin 1 and 5. 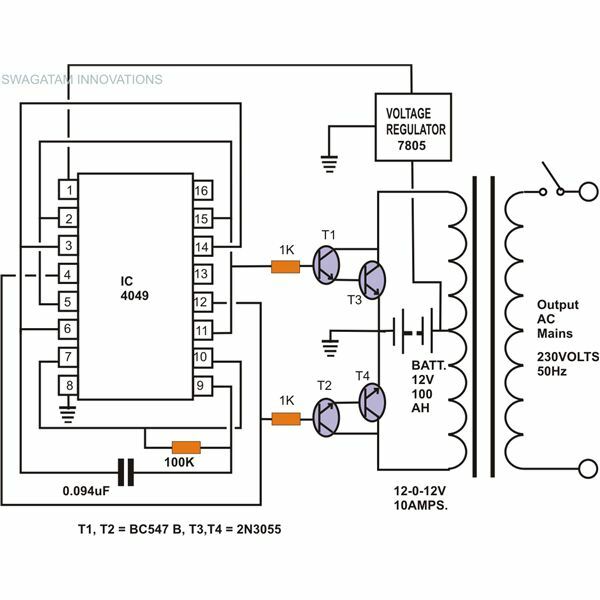 Other than audio amplifiers many different small circuits can also be built using this versatile chip; the following datasheet will provide you with more added information.